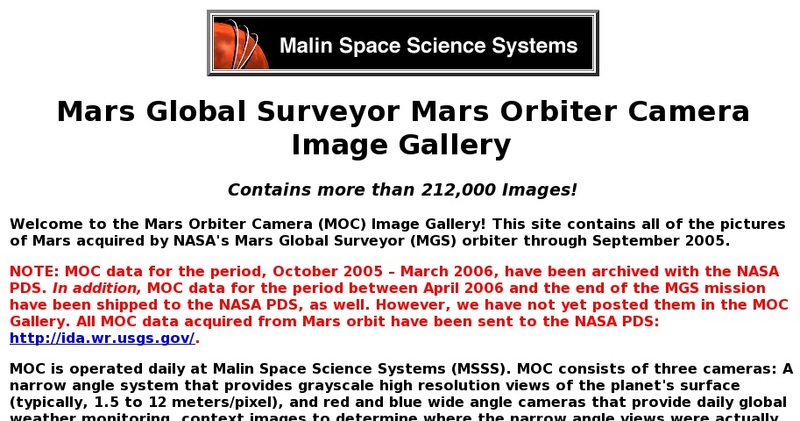 This site from Malin Space Science Systems provides access to all of the images acquired by the Mars Orbiter Camera (MOC) during the Mars Global Surveyor mission through March 2005. MOC consists of several cameras: A narrow angle system that provides grayscale high resolution views of the planet's surface (typically, 1.5 to 12 meters/pixel), and red and blue wide angle cameras that provide daily global weather monitoring, context images to determine where the narrow angle views were actually acquired, and regional coverage to monitor variable surface features such as polar frost and wind streaks. Ancillary data for each image is provided and instructions regarding gallery usage are also available on the site.